I have always been fascinated by the one-room school-house ideology. In this picture from 1921, the kids are present although some are barefoot and others are hiding. In the far right corner there is a girl, reading a book. One glaring difference from a modern-day classroom is the teacher. First of all, she is seated. I worked in a county where a teacher would be “written up” if found sitting, disengaged from the class, during instructional time. The teacher seems to be looking in one direction, while doing some random task with her hands. There are no books or pencils. I don’t see a five-inch notebook jam-packed with lesson plans. What on earth are they all doing? Do they do that all day? Did she have a planning period? Did they have state mandated tests? I bet there were no fire drills that interrupted the mysterious activities occurring in that photo. Do you think those kids went home buzzing about all the great things they learned that day? I wonder if she sent a newsletter home each week, stuffed Friday Folders with graded, weekly classwork, or took ice cream orders? Or, did she just sit in that chair, wear sensible shoes, and watch the door for escapees? Little House on the Prairie inspired me. I loved the books and I was completely obsessed with the series. Laura was just spunky enough to keep us all tuned in. The school scenes were my favorite. When Laura fought with Nellie in the mud, my life was complete. In simpler times, did the kids learn less? Did the teachers get to school early, stay late, and work through the weekends? The next phase of my school fixation was the show Fame. I was in high school the entire run of the show. Did my mom know about this school? Did they do any math? They wore leg warmers, sang in the hallways, and performed perfect impromptu dances without any practice! Had there been Internet, I would have found my very own FAME school. I took dance for years. I cannot count how many times I practiced the split roll-over and toe touch. When I was suckered into representing the cross-country team in the school pageant, I wore a magenta, spandex, unitard and danced to MANHUNT. I have no pride. I imagine there was no dancing in the one-room school-house. Debbie Allen was nowhere to be found talking about “big dreams”. I don’t think I would be a good teacher in 1921. I would feel that there should be something “more” to be done or learned. I would have no colleagues to dish with at lunch. My friends might think that I would create some type of academic compulsion. Maybe, I would re-arrange the benches and color code the girls’ bows. I would possibly go a bit crazy and actually talk to the students-even the one hiding in the back. Hopefully, one hundred years from now, there will still be teachers. They will study pictures of us teaching in classrooms instead of in space stations, or in Jetson’s inspired flying communities. I can only imagine where their history curriculum would begin. It is good to think of simpler times in education. More is expected of teachers and students than ever before. I know I make my job more arduous than it needs to be. What I do in three hours, others do just as efficiently in thirty minutes. I can’t stop. Each time I attempt to work smarter, I find some task that needs immediate attention, or a project that needs to be created. Maybe, I can plan a class song and dance routine….with legwarmers. What? Theater Arts in Elementary School? I have done it. I have stepped over the edge of reason in my job. I thought I had reached this summit last year when a colleague and I organized a re-enactment of the Civil War for the entire fifth grade to perform. We put Scarlett O’Hara in the midst of the battle scenes for a twisted take on the entire event. She even flirted with Lincoln, thanks to my other theater friend who helped write the script. Now, another colleague, the artistic director from The Shakespeare Studio, and I are the co-teachers of drama club at our school. We have seventy-five kids who eagerly attend. So, we have decided to have three performances in May. (I’ll get back to this). I have learned a few things about trying to trail-blaze something like theater arts in elementary school. First of all, theater kids are always just plain, cool. I don’t care what age they are. They have this inherent knack for understanding the global view of the world. Many of these kids can be “restless” in the classroom, so they desperately need the outlet. There are no drama clubs in elementary school. That is the other thing I learned. If you have ever directed 26 kids in a play, you know that theater has to be a burning passion in your soul. Or you are a psychotic overachiever. I also learned that kids dig Shakespeare. Witnessing kids of all academic propensities recite and understand Shakespeare, humbled me beyond recognition. Our school has a faux stage. One year, the teachers ate lunch up there, with the curtains closed . The entire year, I dreamed I was on the stage eating when suddenly the curtains opened to a cafeteria of a million children watching me eat. I bless the day we were given our very own room to microwave, vent and hide. Set building on a faux stage should be a competition on the Amazing Race. Back to Drama Club. We have seventy-five kids. Did I mention we have seventy-five kids in our drama club? My colleague and I are a bit like Lucy and Ethel on a good day. 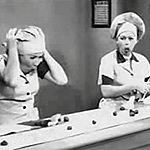 Think of the episode where Lucy and Ethel are working at the chocolate factory. We have three performances looming. Our idea is to do one musical, one “straight” show, and one work by Shakespeare. Thank goodness our Shakespeare guru has shown up in our hour of need. I cannot say how many, “What are you thinking?” comments we get. I learned that plays and royalties are expensive. Musicals are outrageous..don’t get me started on anything Disney. There are contracts to sign and papers to fill out. We have to decide how much we will charge and how many will attend. 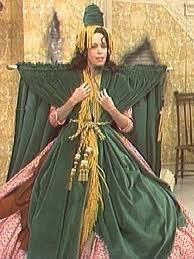 We need a rehearsal schedule, costuming, set materials, and builders. Last week, during our improvisation practice, a group of kids became a giant JENGA game. They collaborated and improvised so well, that the entire room knew what they were doing. 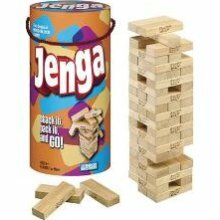 One Jenga piece would be pulled by a player while the kid-tower stayed in place. They left us all speechless with their unbelievable creativity. Foreign language, art, music, and theater arts are deemed disposable subjects. I won’t get on my drama box about how important these subjects are. We all know that deleting these options from the curriculum is a travesty. Enough said. I have seen theater arts change how children perceive themselves. Under-the-radar students suddenly become confident and capable. I have yet to find a child not find a role in a theater arts project; tech, lights, costuming, etc… I can pull up the standards that connect to all of this. I can even put them in a spread sheet. But then my Excel obsession would resume, and my loved ones would shun me. Smile next time you see a theater kid.